Another book from our first book swap! This one is by Maiko of Flurrsprite's Nook. This is a well-travelled book. 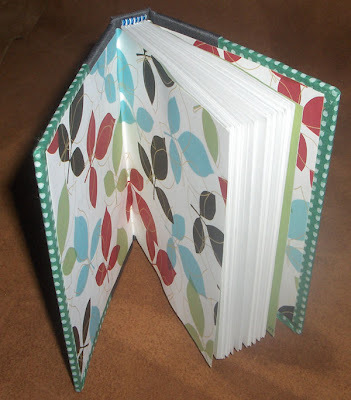 It began in the USA, where the paper was cut in Pennsylvania, then the book was bound in Missouri. After that, it was shipped to Canada where it stayed for a couple weeks, and then it was shipped again to be with its new owner in Australia! 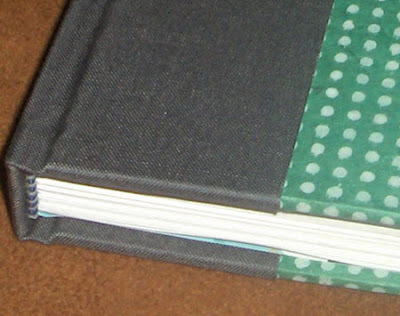 Concerning its construction, Maiko describes it thus: the signatures were sewn out of cardstock using the kettle stitch method, then layered with some cheesecloth-like material, and placed onto the binder's board cover. 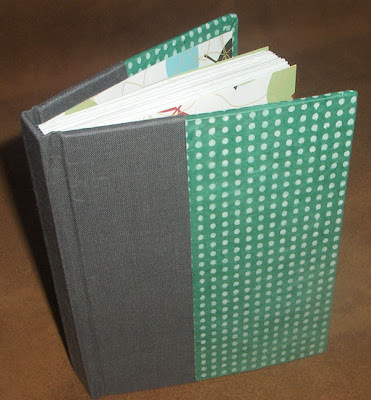 Gray bookcloth and mint with white polka dot lokta paper were used on the outside cover, and the inside was lined with rainbow leaf cardstock. Gorgeous book. Love the attention to detail! thanks rhonda and risamay! :D i hope you participate in the swap next time too! looks great, maiko. love the endpapers. I got this book on Christmas Eve - what a great present! This book is lovely - such a perfect size.